In commercial and technological terms, Japan is still the dominant economy in East Asia and the leading source of product, production and management innovations in the region, especially in the automotive and electronic industries. However, China is slowly catching up. The development of bilateral foreign trade, the increase of Japanese FDI and ODA towards China, and intensified financial and technical cooperation illustrate the considerable potential for mutually profitable business. The Chinese market is opening up and Chinese products are gaining in competitiveness in world markets, threatening the incumbent Japanese firms. Japanese and Chinese companies face each other across a changing competitive environment, which is posing new challenges to corporate and business strategies. Within the context of these developments this book gives different perspectives on how Japanese companies are reacting to the challenges and opportunities offered by China. The book is the result of an international conference in Tokyo entitled “Japan and China: Economic Relations in Transition” which took place in January 2001. The DIJ organized this conference in cooperation with the Fujitsu Research Institute (FRI). The book presents an analysis and an evaluation of the various microeconomic aspects of the Sino-Japanese relationship. By focusing on competitive strategies, investment, economic and business cooperation as well as management activities and strategies and other topics, this book will help to close a gap in the landscape of Sino-Japanese literature at the microeconomic level. 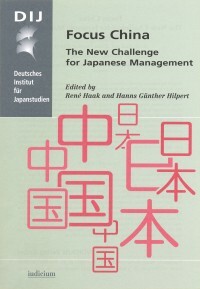 It will be a useful tool for students, scholars, and managers doing business in Japan and China.